We are often asked and motivated to enhance our strengths, while encouraged to push aside our weaknesses. Educating ourselves on our flaws is as intriguing as knowing all our positive qualities. Even the rock of the group Taurus, the feeler Cancer and the social butterfly Libra among the other signs have flaws they must work on. 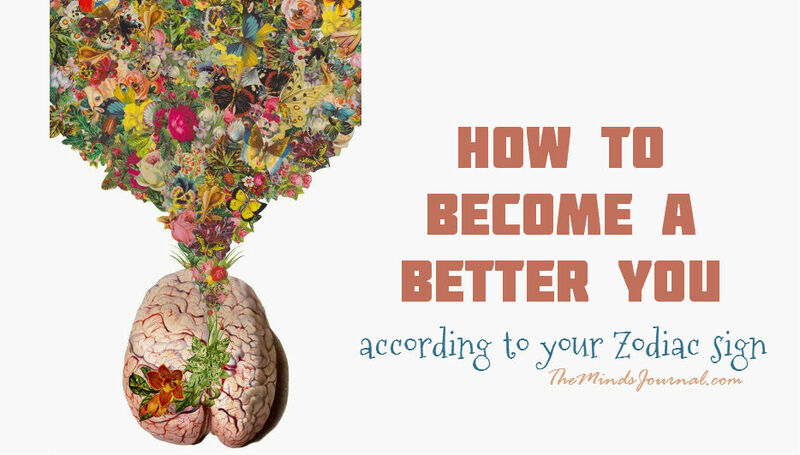 Read on to discover how to become a better you. You’re the courageous type, and doing things well – quickly and with flair – comes naturally to you. Think about cultivating sensitivity, as well as practicality that will allow you to figure out in advance what works and what doesn’t. If you succeed, your inspirational approach will pack an even greater punch! You’re steady and sensible, a rock of stability. But rather than acting the part of a deeply rooted oak tree, try being a reed that bends in the breeze and adapts to others. Find the faith to follow your hunches, rather than double-checking all the practical angles. If you listen to your heart, your strength will become more effective. You are a thinker, talker and mover. So, try standing still for a change! You won’t die of boredom. Dive deeply into your current projects rather than scattering to all four winds. Feel your way into situations, instead of standing back and thinking. You’ll never allow yourself to turn into a stick in the mud, but you’ll find that your efforts will pay off handsomely. You’re sensitive, creative and hopelessly active. For one day try shutting your heart. Listen to your head. Develop detachment so you can shut out distractions. If you learn to be more resilient and secure, your amazing ability to sniff out possibilities will be that much more powerful! You’re sunny, outgoing and naturally optimistic. What you’re not, however, is realistic or inward-looking. Plan before you jump into action. Take quality time on your own and enjoy it. Everyone else thinks you’re wonderful, but you need to convince yourself of this – without an audience. If you do, you’ll sparkle ever more brightly. You’re practical, helpful and not a little fussy. But you need to find your hidden fire, which means cultivating optimism, taking the odd risk, and following your dreams rather than your duties on occasion. Be bolder and more proactive, and flamboyant rather than understated. Your new vitality will sweep you on to victory! You’re a social and a charming talker – a natural mediator. Now go ahead and toss that tact out the window and focus on yourself for a bit. Forget about gaining approval and being respected; instead, get down and dirty. There are nuggets of gold in the gutter that are yours for the taking. You live naturally with passionate intensity, and you require depth of feeling like few others. Because of this, standing back to think will take some effort on your part, and so will practicing the art of letting go without harboring bitterness. You’ll never be superficial, but you’ll find that living on the surface adds a missing dimension to your existence. You’re excitable, hopeful, restless and always looking to expand the potential of whatever you’re involved in. Having to be practical feels as if it’s taking a bite out of your dream. But if you put a limit on your inspirations and box them in, you’ll find that you’ll consolidate your ambitions. Think less instead of more. You’re earthy, sensible, ambitious. You need to cultivate your sense of vision, nurture your dreams and develop your faith. Try harder to be optimistic instead of pessimistic, fiery instead of leaden, and reckless instead of cautious. Inject some spontaneous enjoyment into your life and you’ll never look back. You’re cool, detached, firm and independent. Your first goal should be to find some fire to breathe warmth and vitality into your ideas. Don’t be scared of your feelings, since they’ll be your main portal to greater fulfilment. Get out of your head and down into your body, heart and guts. Live multi-dimensionally. You’re a creature of the cosmos and the oceans, floating and swimming your way through life. Dry land is your least comfortable realm, so learn to become rooted in reality by bringing your visions and dreams down to earth. They may be less perfect, but they’ll be more likely to happen. Take your wobbly self-confidence and give it a shot of adrenalin! Then, nothing will stop you! ….i'm a Capricornian through and through…like it ! !